Skintegrity Wound Cleanser - 16 oz. 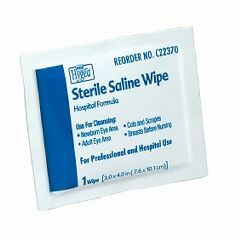 The Hygea Sterile Saline Wipe is ideal for post-operative eye care and dressing changes in the hospital and home. Contains lint-free applicator saturated with an isotonic solution of sodium chloride. clean skin . Prior to medication. Pressure sores due to M.S. Use this to clean skin before applying medication to pressure sores. Individually wrapped. Very convenient. It does what it's supposed to. I use this product to clean around the tracheostomy of my sister as well as around the food peg. I feel it is very important that the saline be sterile to avoid infections. I love this product because the size and softness is ideal to clean around those areas. Easy to use. Sterility assured. Really convenient to use, easy to open, and size is just right for wound care. Can these wipes be used for self catherization tubing?